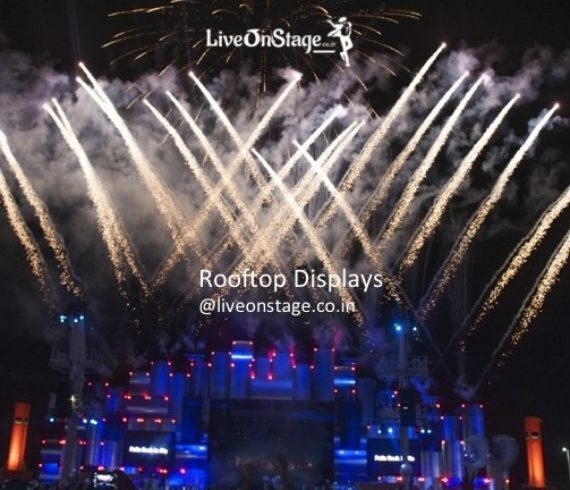 Stadium Rooftop Displays – Multi-Shot Devices are high-impact, rapid-fire effects. These devices, known also as “cakes,” constantly paint the sky with endless colours, noise and special effects. Some devices can produce over 400 shots in just 17 seconds for an amazing spray of vivid colours. The multi-shot devices reach heights between 60 and 100 ft typically. They serve two main purposes. For larger displays they offer the ability to create a “layering” effect of height. When low-level multi-shot devices are being used aerial shells can be producing complimentary designs higher in the sky to create a tableau of various colours and emotions. These devices can offer an amazing display with or without aerial shells. Mines and Comets shoot assorted color balls and streaks of fire with special multi – effects such as crackling, tail effect 60 to 100 feet into the air. It is also combined with Aerial Fireworks Display to give breathtaking finales for your event. They can also be executed on stadium Rooftops and from the ground.